Union Township—On Sunday, November 12, preservationists Phyllis and Kevin Mitchell will present an overview of Pine Forge where iron was first made in Pennsylvania. Sponsored by the Friends of Hopewell Furnace, the free program will begin at 2 p.m. in the Hopewell Furnace Conference Room. From the beginning of the 21st century, the Mitchell family has been working tirelessly to preserve the Rutter Mansion and out buildings located at Pine Forge Academy which is owned and run by the Allegheny East Conference, Seventh-day Adventists. Phyllis Mitchell is the President of the Pine Forge Historical Society which is charged with the site’s preservation. Considered the father of the Pennsylvania iron industry, Thomas Rutter started the first iron bloomery in Pennsylvania in 1716 on the banks of the Manatawny Creek in Douglass Township, Berks County. Rutter’s forge sparked the beginning of the many Pennsylvania iron forges and furnaces that became so critical to the winning of the American Revolution and the eventual success of the American iron industry. Three hundred years later, Berks, Chester, and Montgomery Counties continue to play a mighty role in all aspects of the metals industry. 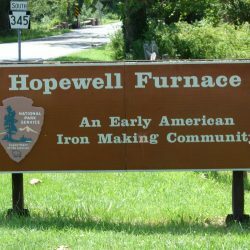 While at Hopewell Furnace National Historic Site visitors are encouraged to go into the village, tour the buildings, see Hopewell’s water wheel and learn about iron making and why Hopewell Furnace is important to our nation’s history. Open 9 a.m. to 5 p.m.; Wednesday thru Sunday, the park is located five miles south of Birdsboro, PA, off Route 345. For more information visit www.friendsofhopewellfurn.org.